New Philadelphia was founded by Frank McWorter, a free African American, in 1836. McWorter was born in 1777 in Union County, South Carolina. His mother, Juda, was born in West Africa, and after being abducted into slavery, was purchased by a Scotch-Irish plantation operator in South Carolina named George McWhorter. George moved his operations to Pulaski County, Kentucky in 1795. Frank was so industrious he convinced George to permit him to stay on and run the Kentucky farm operations when George decided to move again, this time to Tennessee. Frank married Lucy, an enslaved African American living on a neighboring farm in Kentucky, in 1799. While in Kentucky during the War of 1812, he started a saltpeter mining and production operation in his free time, and succeeded in accumulating earnings through that work and by taking on wage-paying tasks for other neighboring farms in his spare time. With those earnings, Frank purchased freedom for Lucy in 1817 (for $800) and himself in 1819 (also for $800). In time, he succeeded in purchasing freedom for a total of sixteen members of his family, with a total expenditure of approximately $14,000 -- the equivalent of over $300,000 in today's currency. Click on the image at the left to view the topography around the site of New Philadelphia from excerpts of the United States Geological Survey's 1990 digital raster maps and Geographic Names Information System database. Shortly after gaining his freedom, Frank also began to invest his earnings by purchasing land in a largely undeveloped area of Pike County, Illinois, situated in a region of hill country between the Mississippi and Illinois Rivers. He and his family moved to Pike County in 1830. Frank recorded his legal name as McWorter, subdivided and sold tracts of the land he had purchased there, and then platted and legally registered the town of New Philadelphia. He and his family developed their own farmstead in the area to the north of this new town, raising crops and livestock, among other endeavors. New Philadelphia was the first town established by a free African American before the Civil War, and it likely served as a stopping place for the "Underground Railroad" of enslaved African Americans who were fleeing northward from the oppression of southern plantations. Use the image on the right to see an 1872 map of the town lots and streets of New Philadelphia, and records of the numerous landowners over time. 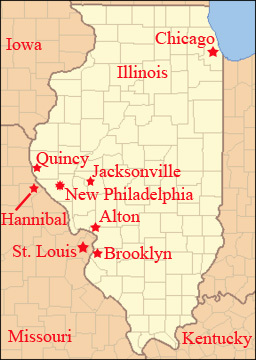 The site of New Philadelphia was located in Hadley Township, not far from the Mississippi River valley to the west and the Illinois River valley to the east. At the time it was founded, proposed construction of an Illinois-Michigan canal had helped spur the establishment of a number of towns, including New Philadelphia and the town of Barry a few miles away. New Philadelphia developed as a town at a crossroads in this agricultural area through the 1860s, with an active roadway carrying agricultural products and other goods to the Mississippi River, 20 miles to the west. The community also grew within a region torn by racial strife, with clashing factions of pro-slavery and abolitionist interests in Hannibal, Quincy, Jacksonville, and Alton. The town size grew to approximately 160 people, 29 households, and several craftspeople and merchants by 1865. Frank had witnessed that growth until his death in 1854 at the age of 77 years, while Lucy lived to 99 years of age, raising their family until her death in 1870. Planned construction of the first rail line through Pike County, to link Naples, Illinois with Hannibal, Missouri and the Mississippi River, helped further invigorate area land sales and development in the 1860s. However, when this railroad was built in 1869, it bypassed New Philadelphia and had station stops at Barry and the new depot towns of Hadley Station and Pineville (later called Baylis), formed in 1870. Occupation of New Philadelphia declined thereafter, an order entered in 1885 dissolved the legal status of the town, and the site is now covered by farmlands (see Walker 1983, reissue edition 1995). Use the images above and to the right to see 1939, 1998, and 2005 aerial photographs of the landscape on which New Philadelphia was located, with approximate overlay of the town lots as platted by Free Frank McWorter in 1836. This web page presents information available from maps, surveys, deeds, census data, tax records, newspaper archives, and archaeological investigations of the New Philadelphia area. An excellent study of the history of Free Frank and the town he founded was written by Dr. Juliet E. K. Walker, a descendant of Free Frank and a Professor of History at the University of Texas. Prof. Walker's book, Free Frank: A Black Pioneer on the Antebellum Frontier, University Press of Kentucky, 1983 (reissue edition, 1995), is available from booksellers such as Amazon.com. Additional social, historical and genealogical research, and a list of published books concerning the McWorter family, are available at the McWorter Family website, edited by Dr. Abdul Alkalimat (Gerald McWorter), the Director of Africana Studies and a Professor of Sociology at the University of Toledo. A collaborative project of archaeologists, historians, and members of the local and descendant communities is underway to further research the social history of this demographically integrated town and to enhance its focus in our national memory and heritage. Participating organizations include the University of Illinois at Urbana-Champaign and Springfield, the Illinois State Museum, DePaul University, the University of Maryland's Center for Heritage Resource Studies, the University of Central Florida's Public History Program, and the New Philadelphia Association. Sprague's Kinderhook Lodge has also provided generous support. 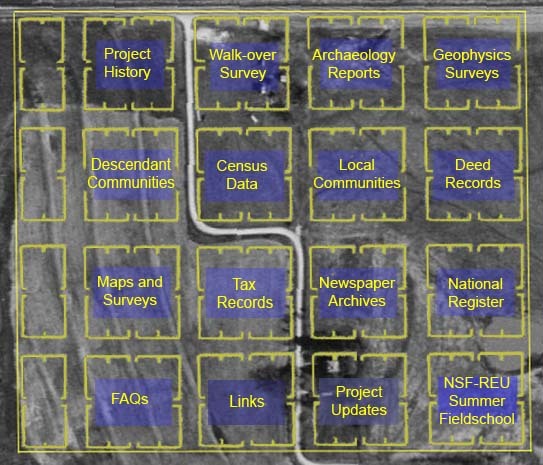 In 2005, this project succeeded in placing the entire town site of New Philadelphia onto the National Register of Historic Places as a nationally significant archaeological resource. In 2008, nomination of the town site to National Historic Landmark status was approved by the National Historic Landmarks committee in Washington, D.C. Patricia McWorter presented an eloquent and moving statement on behalf of the McWorter family at that hearing on the powerful legacies of New Philadelphia and Frank McWorter. This nomination received official support from U.S. Senators Barack Obama and Richard Durbin; U.S. Representatives Ray LaHood and John Shimkus; Illinois Senators Deanna Demuzio, Emil Jones, Jr., and John Sullivan; and Illinois Representatives Jil Tracy and Mary Flowers, among others. The nomination received final approval by the Secretary of the Interior in January 2009, and the New Philadelphia town site is now recognized as a National Historic Landmark. In 2014, U.S. Senators Richard Durbin and Mark Kirk advanced a bill in the Senate (S. 1328), and Congressman Aaron Schock advanced a matching bill in the House of Representatives (H.R. 930) to have the National Park Service assess the New Philadelphia National Historic Landmark site for inclusion as a unit in the NPS system. President Obama signed this legislation into law on December 19, 2014! Choose from the resources on the image below to learn more and to participate. Follow the field school link below to learn more about our ongoing archaeology work, supported by the National Science Foundation's Research Experiences for Undergraduates program. This site presents information in a basic web format. Go to our Web 2.0 portal if you'd like to participate in these discussions using more interactive resources. Some of the materials presented here are based upon work supported by the National Science Foundation under Grant nos. 0353550 and 0752834. Any opinions, findings, conclusions, or recommendations expressed in these materials are those of the author(s) and do not necessarily reflect the views of the National Science Foundation. We are also very grateful for the very generous funding support of the University of Illinois' Research Board.